The first case of chronic wasting disease (CWD) in a moose in Canada was confirmed in Alberta earlier this month. The adult, male moose was killed in a highway collision near the South Saskatchewan river, an area where CWD is already known to exist in the deer population. 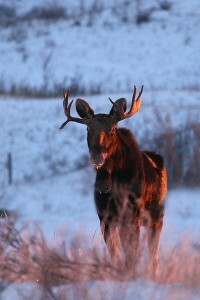 A small number of moose with CWD have been found in the United States. The occurrence of CWD in moose is likely due to inter-species transmission, perhaps by way of environmental contamination. For more information, please see the CWD in moose in Alberta information sheet.